Four e-Verification options provided – Taxpayer can choose any one of the options provided to e-Verify the return. Step 1: Provide the EVC in the text box Click Submit. Generate EVC to registered Email Id and Mobile Number. Step 1: Login to e-Filing Portal through NetBanking. Step 2: Click on e-Verify return. Click e-Verify Return under e-file. 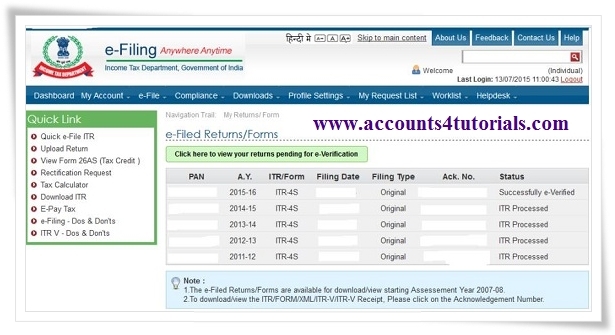 Uploaded returns (120 Days) which are yet to be e-Verified are displayed in a table. Three e-Verification options provided – Taxpayer can choose any one of the options provided to e-Verify the return. Step 1: Login to e-Filing Portal through Ne Banking. I am not getting the option to generate EVC to registered email and mobile number. Why is it so? if your income is above 5 lakhs or there is a case of refund. u cannot generate evc through email and phone no. Thank u for ur valuable answer Mr/Ms.Shreya Bansal. Want to file your Income Tax Return For free.